Click the image to download the LDraw file of this model. 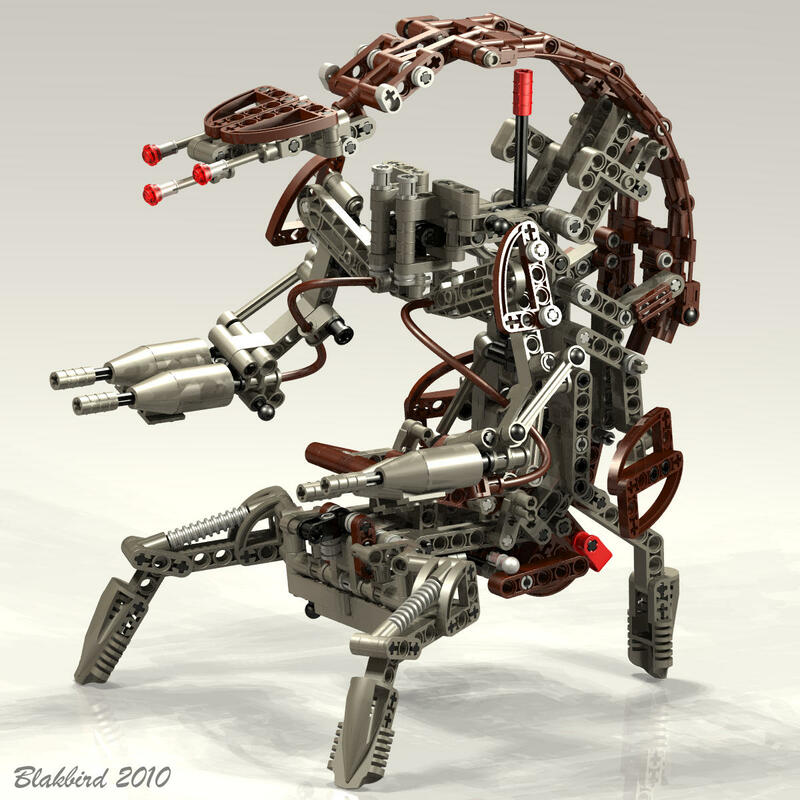 The Destroyer Droid (or Droideka) was among the very first line of Star Wars Technic models. The destroyer droid is featured in Episode 1, the only prequel released at the time. Just like the droid in the movie, this model can be rolled up in ball for high speed mobility and then opened for battle. In this case the mechanism is initiated by multiple pressure points. The mechanism is driven by a series of rubber bands. 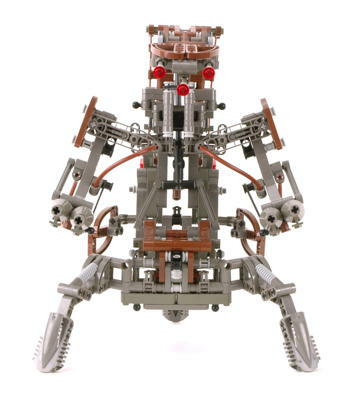 The kinematics of this model are among the most complex of any Technic set ever released. Whomever designed this model is an engineering genius. This model can stand even without the rubber bands, but the "stinger" in particular requires the rubber bands to stay up. The rubber bands degrade over time and eventually fail. Fortunately, extra rubber bands were supplied with the model. 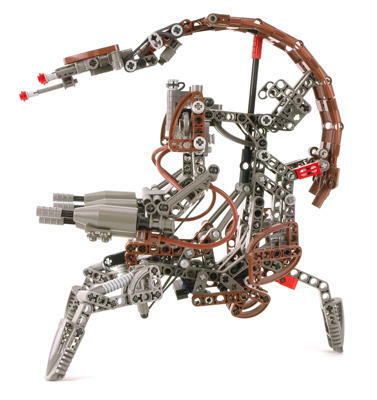 The model construction relies partially on parts from the recent Slizer and Roborider themes, but to a lesser extent than the other Star Wars models. 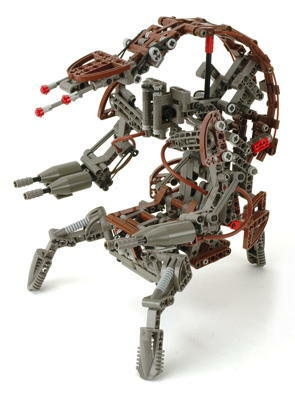 The feet are made from Roborider heads. The remainder of the parts are studless Technic parts in dark gray and brown. 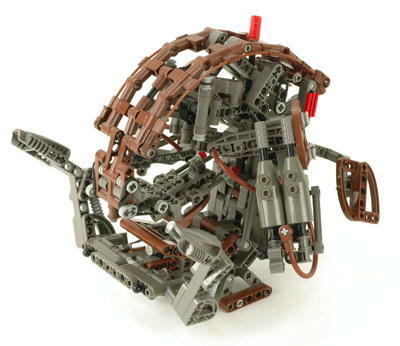 Brown had never appeared before; LEGO® Star Wars was its first (and only) appearance. This model also features the last appearance of the Flex System cables, although in this case they were used only decoratively. 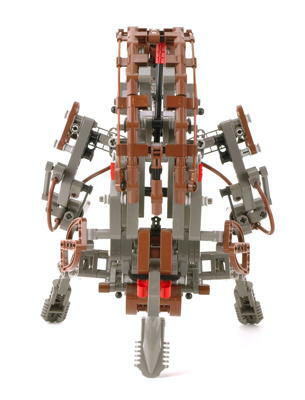 This model is difficult to build, especially for standard Star Wars fans who might not be very familiar with the Technic system. The effectiveness of the mechanism is closely related to the amount of tension in the rubber bands which had to be just right. The instructions were ammended on a couple of occasions to change the number of rubber bands in certain locations. The model includes instructions for an alternate model of an AAT. Of all the Technic Star Wars models, this is one is by far the coolest in my opinion. I highly recommend it as an addition to any collection. Whether you are interested in the technical functions or not, it is also a great looking display model. 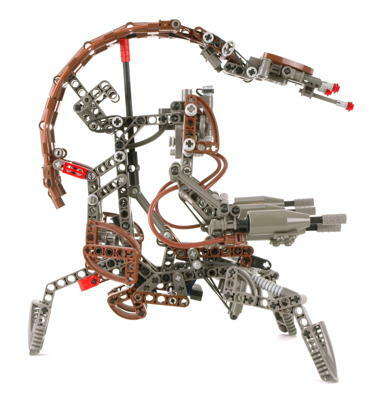 Just like the battle droid in the movie, the model collapses into a ball. It is virtually impossible to describe the complex process of folding the model in words. The rear leg folds upward and is linked to a mechanism that causes the tail to fold and spiral forward and inward. The stinger folds in. Once the tail is folded, the arms can fold back and lock into place with a couple of ball joints. The forearms fold back at the elbow. Finally, the front legs fold up toward the tail. In this configuration, the model is fairly round and can actually be rolled. The protruding red axle connector on the top triggers release of the front legs. Once deployed, the front legs prevent forward rolling. The impact of these legs on the ground triggers unfolding of the rear legs which then releases all other locked features. The rubber bands pull everything into place. When it works, it is incredible to watch. Implied in the above is that it does not always work. The rubber bands need to be just right, the rolling motion needs to be straight, and a hard floor surface is needed.